by Hobson, Art, Baehr, Marie C, Swallow, Earl C.
Hobson, Art, Baehr, Marie C, Swallow, Earl C.
This laboratory manual is specifically designed for use in a physics course for non-science students. 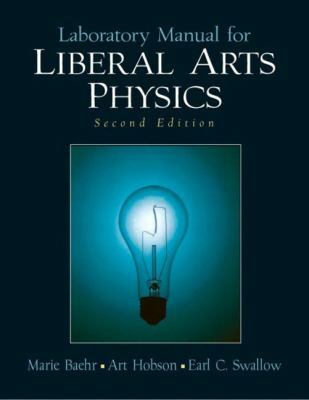 It is particularly suitable for use with the latest edition of the textbookPhysics: Concepts and Connectionsby Art Hobson published by Prentice Hall in 2002. It is also appropriate for use with otherliberal arts physicstexts orconceptual physicstexts. We have sought to provide a substantial set of laboratory exercises specifically suited in both content and structure to a modern course for non-science students. In addition to the usual emphases on illustrating physical principles and providing experience with physical phenomena, these lab exercises have been constructed to show some of the ways in which systematic experimental observation can lead to insight and understanding. We have avoided the ingenuous pretense that important physical principles can be "tested" in an elementary course laboratory. In terms of buzzwords that enjoy some currency, we have intentionally attended to process (sometimes explicitly, sometimes implicitly) in addition tocontentin these labs. Giving non-science students a clearer picture of "how we know" is a crucial function of any liberal arts physics course. We have included a large enough number of exercises that professors can select labs to match the emphases of their particular course. Some of the labs focus on physical principles, concepts, or phenomena; others, on issues of energy and environment; still others, on understanding scientific data, experimental errors, and "numeracy." Although most of the labs deal with topics explicitly discussed inPhysics: Concepts and Connections,some provide extensions or elaborations. The labs can be assigned in a variety of orders to fit differing course structures, with the exception of the first few labs that help to develop necessary laboratory skills. Because the physics laboratory provides an excellent opportunity for students to work together, nearly all the exercises are structured so that they can be performed in a group. Several of them expressly require group work, sometimes requiring the pooling of data from the entire laboratory class. Although this manual can be used effectively without data acquisition computers in the laboratory, many of the exercises in this edition have been structured to take advantage of computers where they are available. In this edition, the possibility of using spreadsheets or graphing calculators has been included wherever it seemed appropriate. Several exercises (#10, #18, #22, #23, and #28) explicitly call for computerized sensors. Several others (#1, #5-9, #11, #30, #31) include provision for using a spreadsheet or graphing calculator. One laboratory in the previous edition that dealt with air pollution has been eliminated because the use of smoke was in conflict with institutional regulations at almost all U.S. colleges and universities. In this edition, many of the exercises have been modified to provide greater clarity and enhanced intellectual engagement. The list ofBASE CONCEPTSat the beginning of each lab is intended to indicate relevant ideas with which students should have some familiarity. It isnot necessaryfor the primary topic of every lab to be discussed in a classroom lecture before the lab is carried out. It is perfectly reasonable and desirable for students to meet some topics for the first time in the laboratory, though doing this will usually require considerable extra effort and care on the part of the lab instructor. If any of theBASE CONCEPTSseems unfamiliar to you as a student, you will probably find it useful (and educational) to look it up in a textbook or a reference book. We have quite intentionally not attempted to make this lab manual an encyclopedic document. We hope this will encourage you to refer to other sources--just as a serious investigator in anHobson, Art is the author of 'Liberal Arts Physics Spiral' with ISBN 9780131011076 and ISBN 0131011073.